I spent some time this summer on a couple of small projects. The first was to make a cotton dishcloth. Certainly not an original idea, I read about handmade dishcloths somewhere on the web and decided it would be a quick, fun item to explore. Of course, it seems that nothing is as simple as it appears when you read about it. First, I had to find the right yarn to have that wonderful soft absorbent feeling when you are actually using the dishcloth. I learned that Lion Brand Yarns makes just the right product - Kitchen Cotton. It comes in 2 oz balls and is 100% cotton. 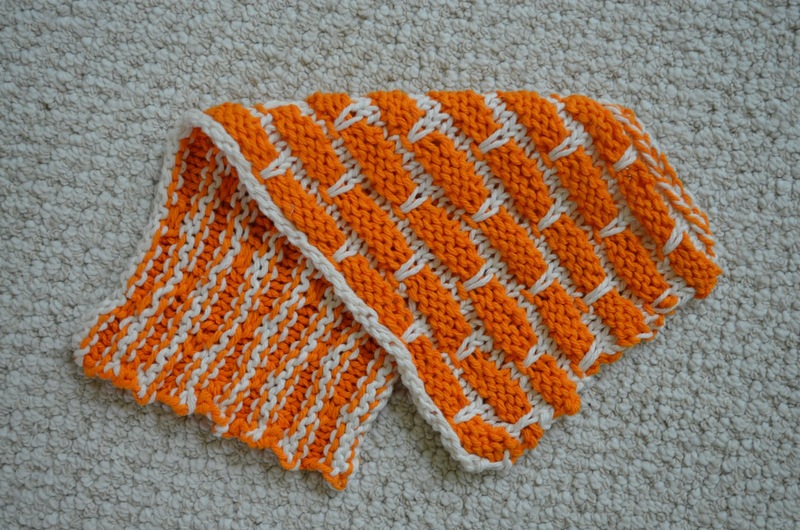 I chose a fairly traditional pattern - the ball band pattern - which required two colors. As soon as I started knitting I realized that dishcloths are much larger than I ever appreciated. It turned into more than an overnight project and in the end, I opted to not have a very large dishcloth. I thought I had resolved to not make any more dishcloths. But, I've noticed that I actually prefer my little dishcloth to the sponges that I usually use. 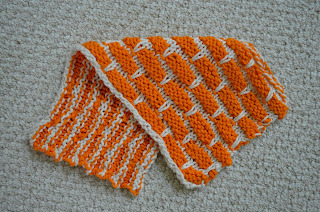 And, in looking on the web for the name of the pattern I used, I found this really neat site called Dish and Wash Cloth Mania with a page that listed variations of another pattern, Grandma's Favorite Dishcloth. They are darling. I think I am going to have to make another! I too have a wee stack of dishcloths that I've made from "Sugar 'n' Cream" cotton (Bernat, I think). I confess that Grandmother's Favourite is mine too, because it's so simple! However, I am delighted to see the variations on the link you shared. As the cloths get grungy (even after washing) after much use, it's always great to have some cotton yarn and a variety of patterns on hand to knit fresh ones. When they get too raggy for kitchen use, mine get recycled for polishing silver and mopping up studio mess! I would not have thought to make dishcloths. Hmmm...I have some of that sugar n cream yarn that has been sitting...perhaps it is time to put it to use.